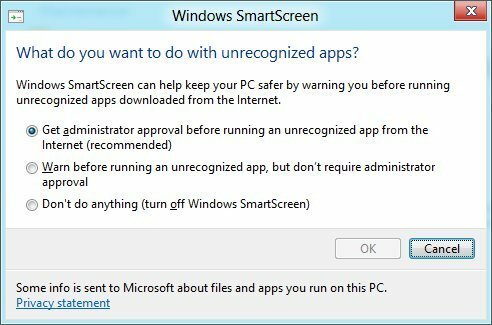 SmartScreen blocks “unrecognised” apps from running if they were downloaded from the internet, using a combination of reputation metrics and signature examination. Trusted Boot is a new boot process that loads anti-malware first, in an effort to prevent rootkits. Measured Boot validates a computer’s integrity by storing boot information in a TPM (Trusted Platform Module) chip so that servers can validate the integrity of clients. AppLocker lets you restrict which files a user can access using group policy. Windows To Go allows Windows 8 to run from a USB storage device without touching the operating system installed on the machine’s main drive, making it easier for employees to run a work instance of Windows on a home PC.